One of the armies I always wanted to do, but never got round to, was the Tau. I made a start at one stage, assembling Fire Warriors with their zillion tiny pieces. Anyway, to cut a long story short I gave up on 40K as a game and so I never got them finished. Then I discovered that FW had stopped making them. Bother. Well Ebay seemed the obvious alternative, but the prices these go for is a bit silly. Scratch that too. I went back to Forge World and had another look. Not quite all of the models had been discontinued: they still make the few bits you can use in their Aeronautica game. Thinking about it I realised that actually you didn’t really need that many different basic vehicle chassis, so I got a pack of Skyrays to see whether I could use them as the basis for the rest. Perhaps I could convert these into Hammerheads and Devilfish. Here’s what you get in a bag of Skyrays: lots of tiny bits on big casting blocks. I’ve set these up so you can see the main bits from several angles. The photo below shows the model assembled in the official shot from FW. In a bag you get all the bits you need for 3 Skyrays, and if you want to convert them to Devilfish you’ll have various spares to decorate weapon platforms or terrain features. Of course, you’ll want some Skyrays anyway. 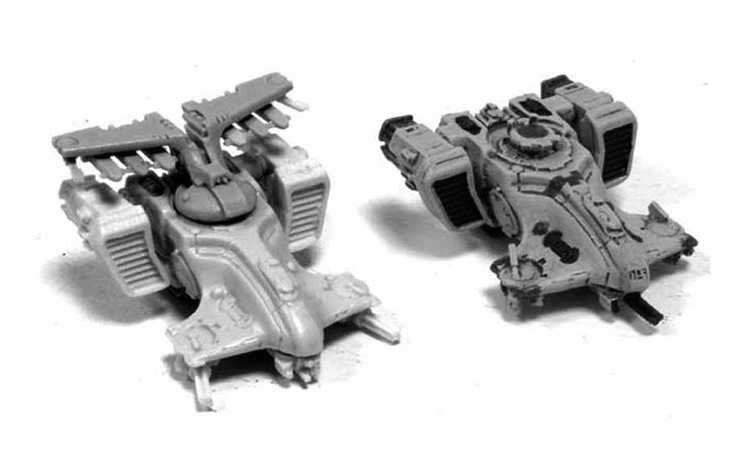 If you know your Tau vehicles, you can see that it shouldn’t be too hard to make a Devilfish (it just needs a different hatch). A Hammerhead will be more effort as it needs a completely different turret, but even that doesn’t look impossible. The models themselves are very nicely done, with lots of panel detail and so on – definitely a better idea to be converting one of these than trying to make one yourself from scratch. 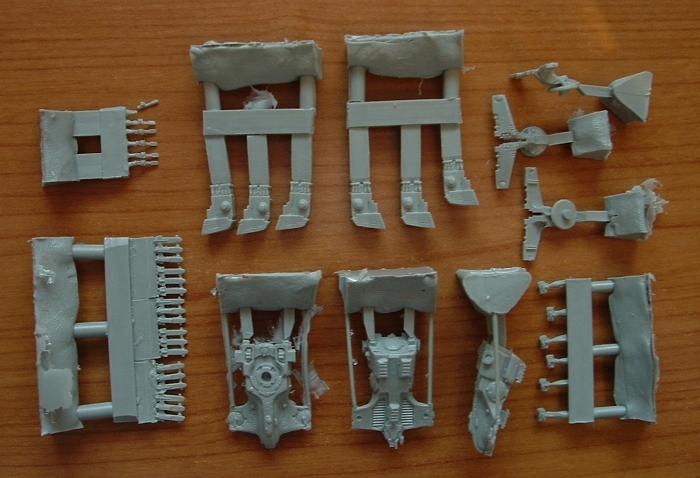 The various guns, missiles and so on are separate pieces, which ensures that the detail is present and not reduced to blobs by compromising the casting. Hats off to the designers and to the overlords at FW for allowing them to be picky like this. It all makes for a much nicer end product. The models are cast in a hard resin with minor mould lines on a few parts and some flash. Nothing that would cause problems and actually rather less than on many metal and plastic models. Of course, you also have to remove the casting blocks. There are also zero bubbles that I can see, which is excellent. Finecast take note. 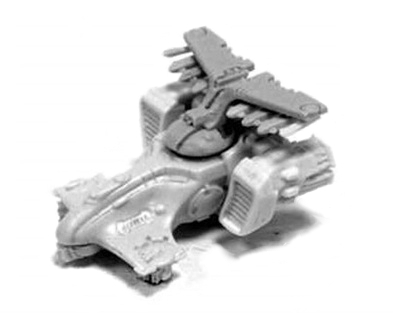 The photo below is another from the FW site, and conveniently shows a Skyray and Devilfish side by side. The only differences are the weapon fits under the front three mounting points/drones and the turret/hatch. As I said, this doesn’t look too hard. Fiddly, yes, but not technically difficult. 2nd Ed. could refer either to the first Space Marine or to the SM/TL aera, it could include the NetEpic updates (after all it´s a continuation of SM/TL started when E40k hit the shelves) or not. And while I have a lot of great memories about SM/TL – the game that got me started in the hobby, I have to say that the E:A ruleset is even more fun. If Dreadfleet is the worst game GW ever did, E:A is the best, it manages to provide more tactical options than any of the others, is amazingly balanced – to the point where army composition is almost completely unimportant for the outcome of the game, runs on very elegant rules (I managed to fit a summary for everything on a single sheet of paper and had room to spare for statlines) and yet is rather immersive. If you are playing Epic, have a game of E:A as well (and blog about it!). FW have been sending out mixed signals about their Epic Tau for a while – in regular intervals they tell the community they will be making them again, then retract and state they won´t, then reverse again… You aren´t alone in that. Space Marine (old), I believe. The one with the little cards for the units. I did play E:A quite a bit, including a couple of campaigns when it came out. You’re right that it is a very slick and elegant system and contains many clever ideas. Epic is, in all its editions, a cracking game and one of GW’s best. That’s not a coincidence, as it’s one of Jervis’ designs. However, one has to pick one version to play, and for all its mechanical cleverness, the abiding feeling I recall from my E:A days is that it had lost some of its flavour. It was a clever game, but in its cleverness it didn’t tell as good a story. Things like the old madboy chart and suchlike aren’t to everyone’s taste, and do make the game less slick, but I do rather like them and it is this level of storytelling ‘grit’ that I thought was lacking. As you say though, it would be interesting to have another go at E:A (as it has been some years) and see if I still feel the same way. I’ll see what tinpot thinks. I’d also been thinking about NetEpic as they have lists for all manner of armies (including Tau), and would make things easy. I skimmed their rules and they have made a few major changes, but are based on 2nd, as you say. As to whether FW will produce the Tau again, I don’t know. I did ask when I bought these and it was a firm no. However, they have all the masters (one assumes) and so it would be no more arduous to reoffer them than it would to keep anything else in production. I am always told that resin moulds wear out quickly, and so keeping an item in production requires continual remaking of moulds. This is no different with the Epic Tau or the latest 28mm bits, so it’s a matter of will rather than any technical trickiness. If they are not a brisk seller, then they could simply remould them, cast whatever they can get out of that set of moulds and put them on the warehouse shelves till they sell. I’m sure FW wants to sell things, and the only reason that I think likely is that they have a bottleneck in mould making and that is full to capacity with keeping the more popular lines available. It might be worth dropping Forgeworld an email regarding their Epic Tau, sometimes they just forget to update the website (this seems to happen a lot with their Epic Warhound Titans) and they may have some lying around? I got mine by visiting Lenton, and had the shop staff ask FW for me when they rang up. Nothing left and no inkling of it coming back as of a couple of weeks ago. The version with the cards would be SM (new), SM (old) had a more complicated army design system published in WD. I’m not sure whether you are confusing E:A with E40k, the latter did remove most of the grit, the former put quite a bit back, without making the system less elegant (arguable it´s more elegant because it dispenses with the need to crosscorelate numbers on a chart). While E40k was elegant, it didn’t have the immersion factor and coupled with the more detailed models that came out the more abstract rules led to something of a cognitive dissonance. E:A has some more detail and a few army specific rules, which do strongly affect the feel of the forces. It´s a game that manages to tell you what makes Necrons Necrons ruleswise in 5 lines, which make the army play very differently from all the others and does a better job than 20 pages of rather convoluted writing in the still current 40k version. The rules also allow for greater differences between infantry units than previous versions and this means that army size varies more. You get more Orks for the same points than in SM/TL, but less Marines. FW had a couple of definite nos before – for instance on their Epic Warhounds (which have now gone back into production and whenever they stop being out of stock, they get back to OOS status whithin 2 hours or so). My plan B to get some Tau was to CAD some models and 3d print them, but that has morphed into designing a 6mm game with a cyberpunk setting (something I haven´t seen so far) and a mix of traditional and informational warfare. I’m not thinking about E40k – it’s definitely E:A I’m talking about. I looked again yesterday at their army lists, and it’s the Orks that suffer particularly. Almost all the rules for clans, different weapons, madboyz and so on have been subsumed into generic big gunz and so on. I think that E:A probably does a better job of modelling the actual command business of a commander by leaving out this sort of detail (which is properly no concern of the overall commander), but I like it. This probably makes SM nearer the game end of the spectrum rather than the simulation end, but that’s fine. Takes all sorts. Your cyberpunk idea sounds intriguing. Cyberpunk is a funny genre. When it came out it sounded all futuristic, but now it seems pretty mundane and current affairs. Not bad, just that the world has caught up with it quicker than expected. Problem with granularising Ork guns is that you end up with batteries of the same gun, as they inevitably work better when organised that way. Which don’t look orky. So, Jervis said “ok, lets have big gunz and zap gunz, one good at battering infantry, the other at battering tanks, and then the physical representations can be the chaotic orky mix that characterises the army, with grot bombs, hop splats and general big gunz for the former, and lifta-droppas, bubblechukkas, zap-guns and shokk attack guns in the latter.” And I think he got that bit right. And then you can do the clans by fixating on particular clan specific stuff. There’s a separate Cult of Speed list and a separate Snakebite list for those, and the others can be covered quite easily by unit choice and creativity in modelling and painting. Deffskulls (I think it is), ferinstance, should be using a significant collection of looted, converted Imperial vehicles. I agree that this approach gives you an orky appearance, it’s the way the army works. For example, in the old version, the different clans behaved differently when they failed to follow orders. I understand the motivation for making the changes, and I think both games work very well. They just illustrate different things. Well I’m looking forward to playing it again. As I said, it’s been a while since I played E:A. Well, other armies have a lot less special rules than under SM/TL – Chaos Cards, Hive Mind Cards, Loads of templates. Madboys are in the Feral Ork list, still a unit of their own. I think reducing the number of unit types didn´t hurt the game and it didn´t hurt to get rid of the clan rules either (the rules for the bubble chukka speedsta might easily fall under both categories of your recent design theory posts). As far as I understand the Ork background, clan differences are primarily a matter of cultural identification, they aren´t huge differences in capability. Not that SM/TL wasn´t fun, I have a lot of fond memories, but as more and more games tend to go for a high number of special rules with core machanics taking a back seat, I find E:A a game that sticks out. I think the zaibatsu do have their own armies – they just aren’t terribly overt about it. It’s variable depending on location. In Africa and Asia, oil companies have heavily armed security forces that can (and do) repel attacks with firearms just like the military. of course, most of them are ex-military,. During the draw down of the numbers of American troops in Iraq, I remember reading a report that said that the money involved remained the same. What was happening was that the US was hiring Blackwater (http://en.wikipedia.org/wiki/Xe_Services) operatives to guard their people instead of using Army personnel. This massaged public pinion back home, and conformed to the letter of the promise to reduce troop numbers, but not the spirit. It’s also cheaper and easier because the US govt can deny responsibility and contractors aren’t subject to war crimes trials the same way official troops are. The speculation was that wars would increasingly be fought in this way. Perhaps the front line troops remain uniformed government men (and women), but security and policing duties would be contracted out. Nor is all this entirely new to the world – just to the US. Since independence, many of the African wars have been fought with mercenary forces hired by companies, not state troops. All over the world, especially in more remote and fractious places, the security for big corporations is done by their own “army”. They just keep relatively quiet about it. I think the only big step left in that regard is serious fighting between company troops and national forces, and that may well have happened (I just can’t think of an example). The driver for that would be the company thinking that it had more sovereignty over a resource than the government, and that hardly seems out of the realms of possibility. Never played it, but its one of many games i would love a go at. I did have some minis a long time ago but they are gone now. As far as E:A goes, there’s a UK tournament scene that’s been developing balanced army lists for tournament play for the last few years, and they’ve got a collection of stuff that GW never got to, like Tau. There’s a group that plays regularly at WHW or at Maelstrom on Thursdays. They’d give you a game if you wanted a crack at E:A. Or I might. I finished off Iron Warrior and Lost and the Damned armies earlier in the year, and have been picking up Tau bits too. If you fancy a game at the club sometime let me know. I need to have a rummage and see what I can find among the many boxes to make a coherent force. Will do. I’ve actually got both IWs and LatD in boxes at work, so I just need to break out the paperwork and scenery in order to be ready to play. Groovy. Maybe it would be easier to borrow one of your armies then. That way you’d actually know what was going on in both armies and I could actually focus on the rules. I still need to dig out my old Imperials, but this would save time. Yep, we can do that too. I could also break out the Imperial Guard, as they’re painted (or, rather, a subset of them is…), and/or the Eldar, as they’re the next thing I’m painting and learning to play, Epic-wise. I’m fairly sure I’m free next Tuesday, if the big table can be nabbed. Post up on the club site when you know if you’re free. Remindes me to finish my Tau for Aeronautica. And for GW AI is astonishingly cheap. Still…. I have to get that Manta these days…. I agree. I think the FW stuff is actually quite well priced for the quality. Unless you order through the webstore. Shipping is 12% of the RRP to UK addresses. And that’s for non-recorded Second Class. Ah, yes, the postage. I thought that was a bit naughty too. Bought mine in person at WHW.